We have seen the technological progress from slow motion to super and ultra slow motion and the added value, interest and analysis it has brought to the viewing of sport, natural history and other areas. These clever systems have been coming in the form of normal broadcast camera size packages but now German company Live Motion Concept, in partnership with Polecam Systems has introduced the Polecam Antelope Pico, a small high speed camera weighing just 850 grams, producing live streaming ultra slow motion in full HD broadcast quality. The Antelope Pico is designed to offer spectacular extreme slow motion and previously unrevealed details from vantage points where, because of its small size, no other camera has gone before. PICO records at up to 525 frames per second in native HD. The system is based on a 2/3" CMOS 2K chip and guarantees high detail and unsurpassed light sensitivity. The unique deflickering technology eliminates lighting-related flicker in real-time. The camera provides both permanent live and replay channels and its telemetry can be remotely controlled, e.g. from an OB truck. It runs on fibre and is small enough and versatile enough to go into almost any position. When mounted on a Polecam jib system the movement of the jib and the smooth flight that the camera creates can add another dimension entirely to the shots. Quadruple Formula One World Champions Infiniti Red Bull Racing recently enlisted the help of Polecam Systems to aid in the analysis of their F1 pit stops using the Antelope Pico camera mounted on a Polecam carbon fibre jib system. The challenge with an F1 pit stop is that it so many critical and important events happen in such a short time. Jacking the car front and back, taking wheel nuts on and off, removing and replacing wheels, adjusting wings, cleaning visors and even removing debris from radiators, and all of this has to happen in just 2.5 seconds. Tenths of a second in a pit lane can win or lose a race. It all happens in the blink of an eye but to really see what's happening - you need the Antelope Pico. "We've worked with Polecam Systems and LMC before," said Al Peasland, Head of Technical Partnerships at Infiniti Red Bull Racing, "but to have the camera moved into an almost impossible position so quickly by the Polecam during our Pit Stop practice sessions within our factory, and then instant replay, it's incredibly beneficial. Analysis after a full practice session is valuable but instant replay after each pit stop is visual gold. It allows us to analyse in greater detail and make changes during the same session to make our pit crew training as optimal and efficient as possible." Jonathan Wheatley is the Team Manager at Infiniti Red Bull Racing. "I've been doing pit stops for 25 years and I can't believe how much I have learnt in such a short period of time. There are things I suspected I knew and have now had them confirmed. If we're able to discover something that can save just a tenth of a second in a pit stop, that can mean the difference between winning and losing a race." During the recent Helsingborg Open event on the Ladies European Tour sports, tracking provider Protracer was working with LMC and official LET production partner U.com Media to demonstrate the next level of golf broadcasting. Normally Protracer's proprietary tracking technology is used either live or in replays. This was the first time it was used in ultra slow motion replay, which provided an entirely new viewer experience and broadcasting opportunity. Protracer CEO Daniel Forsgren said "We are very excited to be combining these two popular and powerful technologies and think it can further enhance golf broadcasting. 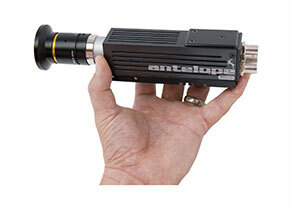 With the Antelope Pico camera the image will be sharp even when viewing a player's swing in ultra slow motion. Couple that with being able to see the exact ball flight with Protracer and we provide broadcasters and TV commentators with a great tool to analyse swings and explain to the audience the cause and effect of the shot." 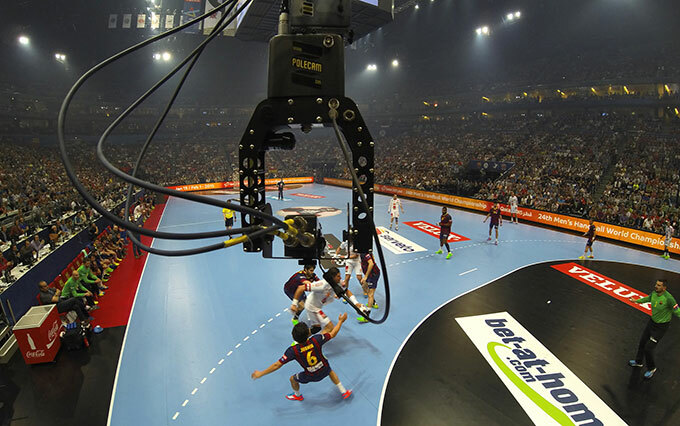 The European Handball Federation's recent Final Four Champions League in Germany was televised by the German Wige Group and enhanced by using the Polecam Antelope Pico camera as well as several of the larger LMC Antelope MkIIs cameras. The ultra slow motion camera systems integrated seamlessly into Wige's 16 camera OB setup, providing both live and replay images not just of the sport action, but also the emotion from the players and spectators. Either on or off Polecam, there are clearly many new as yet undiscovered opportunities for this small advanced technology camera system.